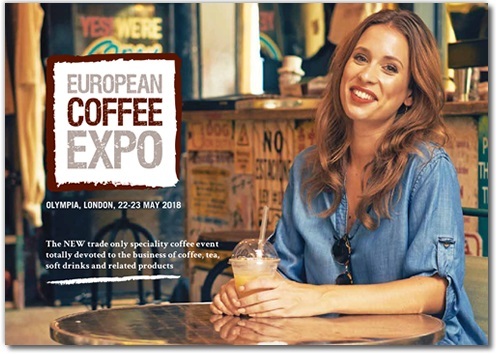 European Coffee Expo will feature an awe-inspiring and FREE conference programme with a headline-grabbing speaker line-up. Secrets of business success revealed. Those all-important current and future trends uncovered. Companies are invited to submit their proposals to take part in the education programme at European Coffee Expo. In addition to the keynote speakers featured in the conference programme, there will also be a workshop and demonstration theatre, featuring live demonstrations from leading practitioners, plus interactive workshops – these will be practical sessions, showing attendees ‘how to’. Swift continued, “Sessions that have already been suggested include: Brewing and barista classes; Coffee pairing; Sensory demos; brewing the perfect cup of speciality tea but we keen for more suggestions from you and our steering panel will then decide which will make it to the stage. Bear in mind when making proposals that our visitors will comprise senior buyers from restaurants, pubs, hotels, fast food outlets, casual dining, contract caterers, retail, leisure, travel, forecourts, supermarkets, health and education work spaces in addition to the artisan coffee and café sectors”. Located at London’s Olympia, European Coffee Expo is organised by Quinic Events Ltd, whose senior team has spent many years working on highly successful events in the catering, hospitality and retail sectors. With a record of close co-operation with the industry, they deliver exhibitions and other events of exceptional commercial value to participants. To find out how to submit a proposal for the conference programme, go to http://europeancoffeeexpo.com/education-programme.